Attention note! - product without box! With Fiammetta, Bialetti 'reinvent' the color. A unique moka that revolutionizes the pleasure of a coffee break, bringing modernity and cheerful tones in the kitchen. Its distinctive lines and trendy colors waking up in the morning full of good humor and surprise your guests with vibrant harmonies of a coffee pot fun, to bring to the table at any time of the day. 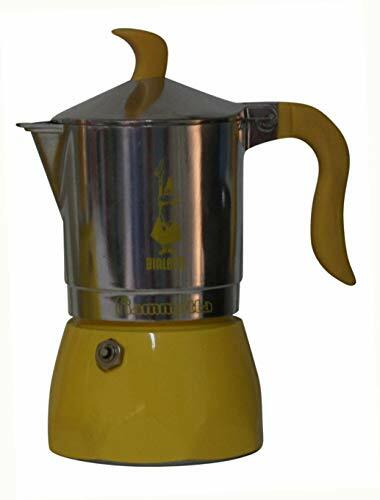 The original Moka Express evolves: the aesthetical transformation is noted in the smoother lines of the handle, knob and top, in the elegant shiny finish and more visibility given to the Bialetti Little Man with the Moustache. The functional evolution improves the ergonomics and guarantees top quality and complete safety. Please note that this cup size is based on espresso cup sizes and not on regular tea or coffee cup sizes. This Moka is suitable for all hobs except induction. Clean the machine well with hot or boiling water, but don't use dishwashing liquid and never wash the pot in the dishwasher.